This window started out as an idea for a friend's bathroom that was being remodeled. 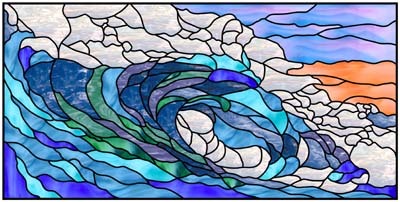 As an avid surfer she wanted a wave design incorporated into a window that was in her shower. Circumstances changed and the house was sold so my friend didn't take the design beyond the drawing stage, but I really liked the design and decided to make the window anyway. The concept for the design started as a watercolor. I prefer to make the initial drawing using watercolors and colored pencils for designs that are not geometric. The sketch has layers of color which are allowed to bleed together. After the color is the way I want it, I then take fine point black pen and outline my color areas so the drawing starts to take on the appearance of a stained glass window. The finished drawing was scanned into Glass Eye 2000 as a background image and the process of tracing began. While I am tracing a drawing I am constantly making changes to the design so it will eventually be a window design that is structurally sound. Most of my designs I construct in lead. This particular window was made using reinforced lead because I wanted to see the limitations of the product. It took extra work and some unique methods to bend the stiff lead around the tight curves, but I was able to make it happen. 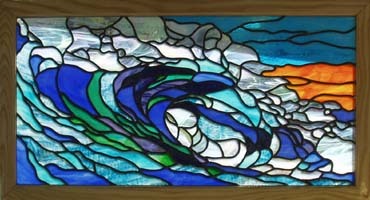 Recently I sold the window to another avid surfer! Krista Leaders graduated in 1994 from California State University Long Beach with a B.A. in Art Education. She spent several years teaching elementary school before she began working in stained glass six years ago. What started as a way to relieve the stresses of a teaching career quickly turned into an obsession. Two years ago Krista opened up Chroma Glass Designs, a retail stained glass shop and studio. You may contact Krista by email.